The Giants retained their defensive and special teams coordinators while promoting Mike Sullivan to offensive coordinator. Eight of the 20 coaches are new to the organization, including three on offense, three on defense, one on special teams, and one on the strength and conditioning staff. Full resumes of each coach are available in the Coaching Staff section of the website. 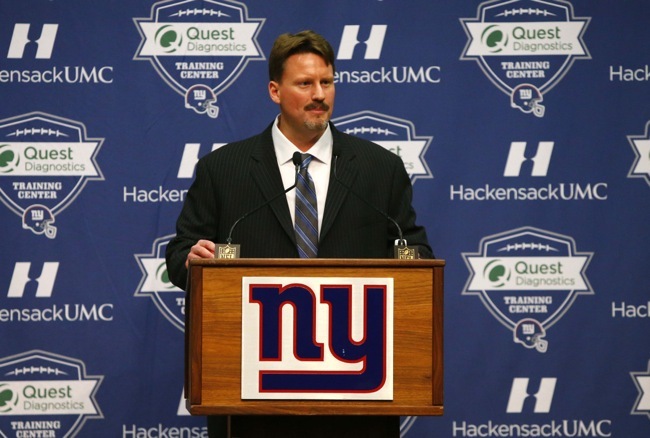 “This is a new staff,” said new Head Coach Ben McAdoo said. “Nobody was retained, there were no holdovers; everyone was hired. When I sat down with everybody on the staff, that was one thing I wanted to make clear. No one was retained, no one was a holdover. Everyone was hired here as part of a new staff. “You have a nice group of guys who I’ve worked with in the past, and then there’s some I haven’t worked with, and some I’ve admired from afar. There’s a nice mix. We talked a lot about putting a staff together that fits, number one, that has great diversity, great personality, and great character, a staff of people who can teach the game. We feel we’ve done that. The next challenge for McAdoo is developing cohesion within the new coaching staff. “I think that it takes a little while,” McAdoo said. “It’s a marriage in a lot of different ways for a lot of different guys, a lot of different positions. The most important thing is we have to get everyone in here and get everyone speaking the same language. It helps that we do have some guys who have been around, and the systems are staying the same on offense, defense and special teams. “Innis is a 6’7 tight end who we have featured many times on NFL Draft Diamonds. Innis is a tall tight end with soft hands. He entered the new program assisted by the NFL and former NFL player Osi Umenyiora a few months ago. Innis has the same size/attributes as Rob Gronkowski. He has been playing American football overseas and was a stud for Kiel Baltic of the German Football League, and finished last season with Senajoki Crocodiles. NFL Draft Diamonds reports that both players have received interest from multiple teams, but their first work out is with the Giants.